GREAT BARRINGTON—It's futuristic but old-fashioned. It's intensely planned, but aloft with the promise of spontaneity. It's orchestral but includes just one musician. Legendary jazz guitarist Pat Metheny's latest project is a feat of engineering and imagination, but succeeds because it transcends novelty to create good music. For "Orchestrion," an album released earlier this year that provides the concept behind a tour visiting the Mahaiwe Performing Arts Center on Sunday, Metheny invented for himself a sort of one-man orchestra, a densely interconnected set of instruments that combines steam-powered Victorian ingenuity with the sensibility of 21st century electronics. Metheny assembled an ensemble including several pianos, a drum kit, marimbas, guitars, dozens of percussion instruments, and cabinets of carefully tuned bottles—all of which he controls through his own guitar, as one might if playing digitized MIDI instruments. He can control them live, note for note, or trigger pre-arranged bits of music, as with electronic loops or samples. But, unlike with those modern analogues, each note created is created acoustically, in the moment; the pre-arranged "loops" of music are not triggered digitally but through a process akin to setting a player piano in motion. There are no computers involved. Each instrument is rigged to operate through solenoid switches (utilizing electromagnetism) and pneumatics (using pressurized gas). 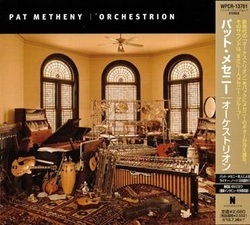 "This is a real odd juxtaposition of super 21st century—on a control level, beyond anything I've seen anybody else do—with something that's really ancient, which is acoustic sound," Metheny says in a telephone interview from his home in New York City. After nine months and one hundred concerts (and a heaping dose of critical praise for the work), Metheny sounds just a touch defensive about what can be seen as the novelty of his creation. "There's never been anybody like me, or anybody at all really, doing something like this at this scale," he acknowledges, but also emphasizes that at the root of the whole thing is just a musician playing an instrument. "A piano mechanism is at least as complicated as what I'm doing, probably more. And there's 88 of them," he says, referring to the keys on the keyboard. "It's not unlike this, in the sense that a gesture is translated into a result. There's some piano players that swing and there's some that don't. That's what it boils down to, it’s the musicians behind it. Talk to the drummer, don't talk to the drums." For all the visual appeal of his orchestrion, and the endless ink that could be spilled simply describing and explaining the process at play ("Even if I have a two-and-a-half hour interview with a musician-oriented, technical magazine, I still haven't explained myself very well," he says), Metheny notes that the essence of what he's doing is simply playing a solo concert. Underneath it all, it's still just him. "There have been a couple people who say that it can't swing. My response to that is, you're saying I can't swing. So let's step out in the alley, buddy," he says, comically raising his voice to an outraged pitch, "or pick up your instrument and we'll see who can swing!" One creative challenge came in the synergy between the impulses of a solo project and the need for careful orchestration. “I don't really feel that connected to the guitar,” he says. It’s a startling statement from someone whose fluidly virtuosic touch on the instrument has been much noted. But he’s illustrating a distinction at the heart of the “Orchestrion” project. And for all the carefully calibrated gadgetry onstage, the orchestrion is no more likely to develop problems than any other instrument—or even musician. Well, when you put it that way—perhaps this lunacy isn’t so crazy after all.